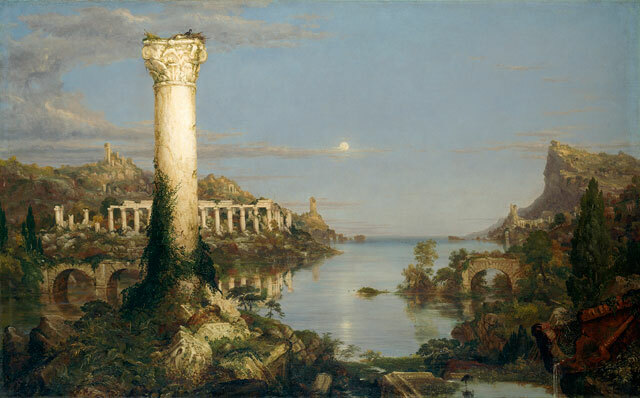 Emily Spicer reviews Thomas Cole: Eden to Empire at the National Gallery, London, on view through October 7, 2018. Spicer writes that the show centers around Cole's "The Course of Empire series, which charts the rise and fall of civilisation over five canvases – a cautionary tale of the dangers of imperial greed and corruption. These paintings were made in the US, the country that Cole and his family would make their home in pursuit of a better life. ... This exhibition tries to dust down Cole’s image, transforming him from just another a landscape painter who fed the colonial imagination by representing empty lands ripe for the plucking, to that of a sort of proto-environmentalist, someone who cared deeply about the natural world and preserving its integrity."